Jason Stirman is part of a select group of early Web 2.0 builders in Silicon Valley. He was there at the beginning of Twitter, jumped with Ev Williams to Obvious Corp and then Medium and is now working on a passion of his – mindfulness for athletes. 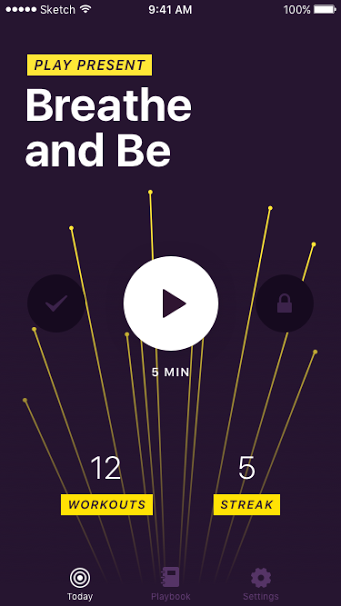 His new app, Lucid, launches in the App Store today and lends advice and mindfulness meditations from expert sports coaches who train stars like Kobe Bryant and Michael Jordan. There are quite a few mental training apps out there already so the app is not without competition. Headspace provides mindfulness and meditation techniques, Lumosity trains your brain, and Omvana is a platform for meditation teachers to hawk their programs. But Stirman didn’t see anything out there for helping athletes to get their head in the game. “Kobe says he owes 80 percent of his performance to mental training,” Stirman told TechCrunch. The training can focus on confidence, being present, visualizing the goal, speed and various other behaviors an athlete needs to succeed for five minutes a day. “Your brain doesn’t know the difference between what you visualize and what you experience so athletes for decades have been visualizing before they go out on that court or the field or the pool,” Stirman says. Will it work? Meditation has become popular in the last few years and is said to offer benefits at work, school and in the home. Google offers meditation workshops to employees and various Silicon Valley startups have started providing mindfulness timeouts to workers. There are also quite a few scholarly articles to back up the claims of enhanced athletic performance through mindfulness training. The Journal of Human Kinetics cites several instances of athletes attaining higher scores or winning competitions through mindfulness training and another major study showed a strong correlation between mindfulness and a better score. Lucid wants to offer the same type of training available to famous athletes to those who aren’t Michael Jordan or Kobe Bryant. The app works by logging on, determining your goals and picking a coach like Aaron Gordon, forward for the Orlando Magic, to guide users through daily meditations. Stirman and his team have so far pulled in $1.5 million in seed for the app from True Ventures, Obvious Ventures, Loic Le Meur and various other angels. The founder says he plans to target the nearly half a million college athletes and close to 35 million youth sports players in the U.S. who could benefit from his app, but that it is useful for athletes at any level. Lucid is free and available to download on the App Store starting today. You can try the meditation training for free for up to five days and the pay either a yearly subscription for $100 or $10 per month.